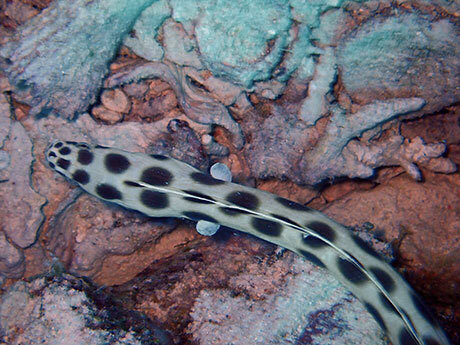 If you see what you think is sea snake in the Red Sea it is actually a snake eel, as there are no sea snakes in the Red Sea. 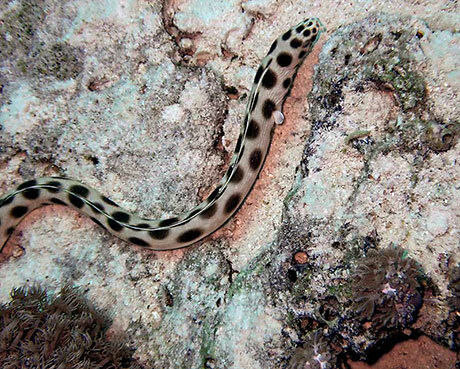 The spotted snake eel mimics the venomous reptiles by looking and moving like a serpent. The subject of its mimicry, though, is kept out of the Red Sea by the saltiness of the water. Feeding on fishes and crustaceans, it hunts by sense of smell. Like a lot of snake eels it burrows into sand. The tip of its tail is hard allowing it to dig down.